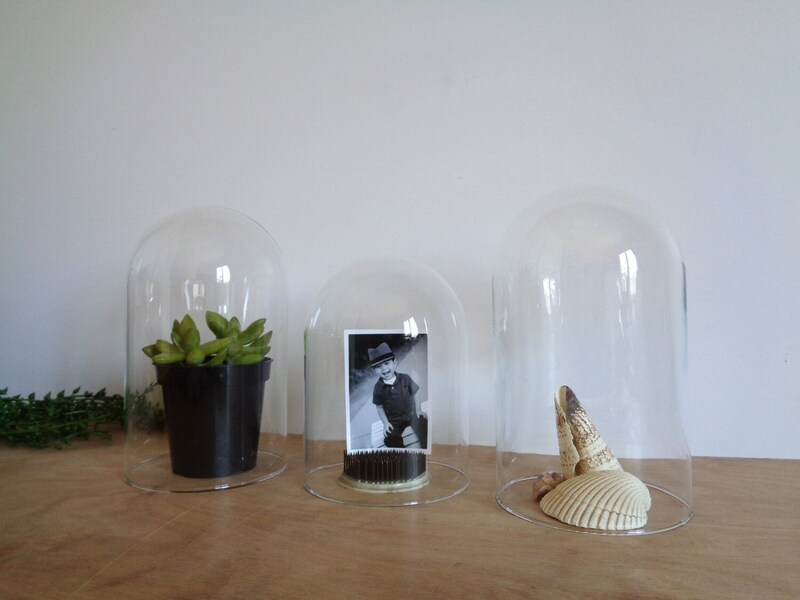 Beautiful glass cloche domes of different sizes. 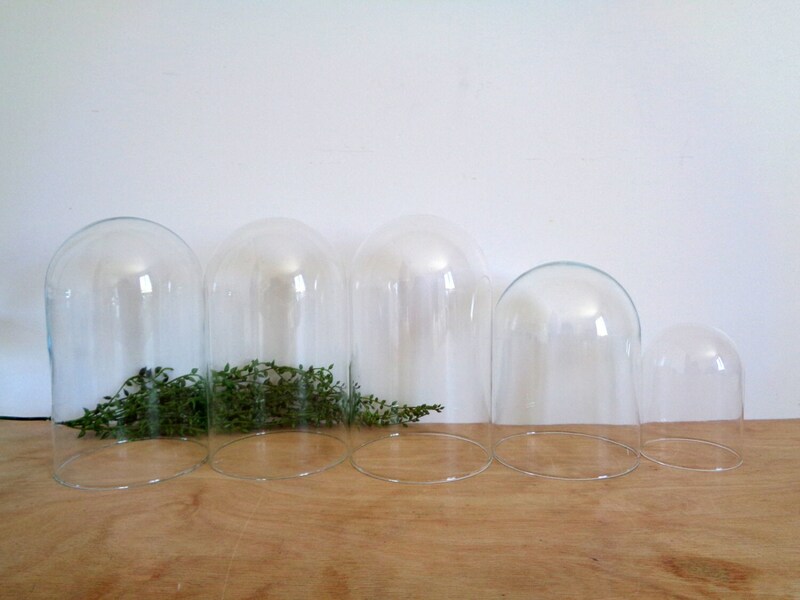 Perfect collection for any table setting, weddings, etc. 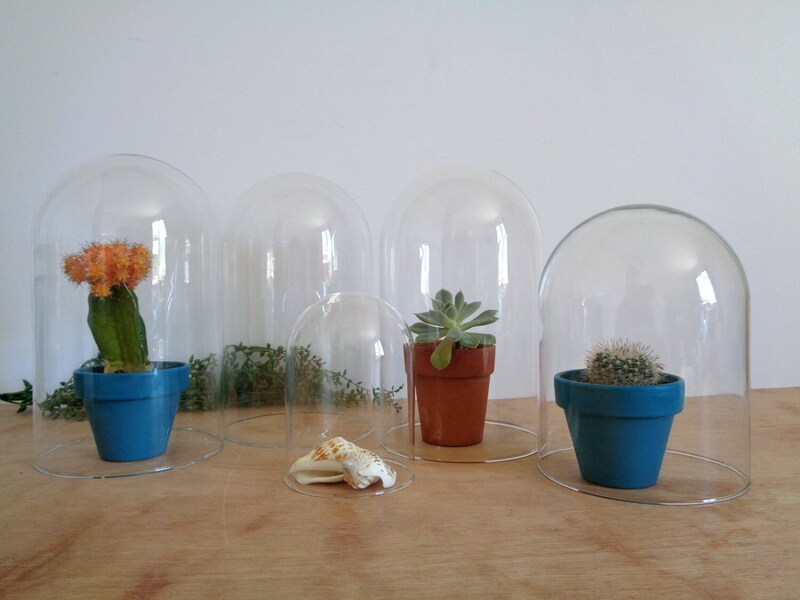 Makes a lovely terrarium or cover for your favorite treasures. Good vintage condition with no major flaws. Very minor scratches/scuffs but no cracks. 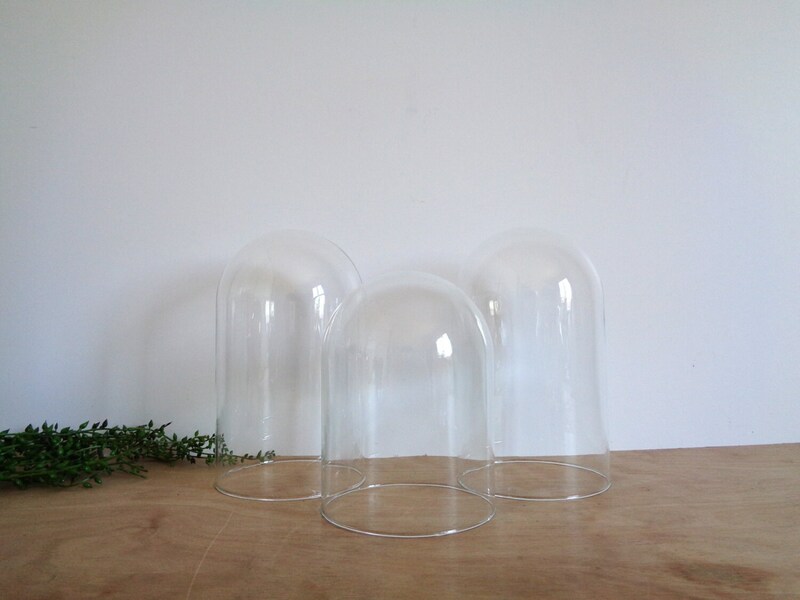 Thickness may vary by each dome. ➳➳ SEND US A MESSAGE for accurate shipping quotes, expedited shipping, combined orders, or general questions. Payment is accepted through Etsy Direct Checkout, PayPal, credit card, and Etsy Gift Cards. Once payment has been received and successfully posted, your order will be processed within the time frame indicated on the item. Reservations/holds on items can be done by request and are typically held for 24 hours. Special arrangements can be made to extend reservations through mutual agreement. However, if you would like to reserve an item for three (3) or more days, a deposit would be required. Deposits are required on items that are reserved for three (3) or more days. Deposit is usually 20% of the item cost. DEPOSITS ARE NON-REFUNDABLE. Orders are shipped via USPS, and larger items via FedEx, UPS or Greyhound Package Express. Ship time varies but will be indicated within each individual listing. Orders are shipped using the most cost effective method. Shipped items will include tracking information but will not include any other additional features unless requested at the buyer's expense. Insurance will only apply to some items up to our discretion and will be indicated in the listing. Any other shipping upgrade or special arrangements (expedited shipping, signature requirements, etc. ), will have to be requested and paid for by the buyer. *PLEASE NOTE* In the rare occasion that your package is delayed, missing, lost, stolen, or damaged during handling by the mail carrier, we will NOT be held responsible. Once we have shipped and fulfilled an order, we are no longer responsible for the package as it is handled through the mail service and no longer in our control. Please see Refund Policy below. We are not responsible for unclaimed or undeliverable packages. It is up to the buyer/recipient to ensure correct address and retrieval of a package. If an item returns as an unclaimed package, the item will be re-listed in the shop unless the buyer requests for reshipment at their own expense. We cannot refund original shipping costs and, typically, mail carriers will not refund shipping labels once a package has been scanned and shipped regardless of successful delivery or not. Your purchase will be packaged securely and from using recycled materials whenever possible. All boxes and packaging materials are clean. Items shipped via Greyhound Package Express will need to be picked up in person. You will need to provide your name, contact information, and preferred Greyhound station so that they can contact you when the item is ready to be picked up. Once your item arrives at your preferred station, you have within three (3) days to pick up your package; after the third day, Greyhound will charge you a daily holding fee which becomes the buyer's responsibility. Shipping/arrival time varies greatly depending upon your location. Shipping through Greyhound is solely dependent upon their bus schedule and the "zone" that your location is categorized in. Each zone has a different estimated ship time which can range from a few days to 6-8 weeks. Please contact them directly for more accurate shipping times and schedules. Please be aware that some items may not be available for international shipping. It is the buyer's responsibility to be familiar with your country's condition for mailing, restrictions and prohibitions. Restricted items will not be delivered successfully. All tariffs and customs fees will be the responsibility of the buyer. *PLEASE NOTE* In the rare occasion that your package is delayed, missing, lost, stolen, or damaged during handling by customs, we will NOT be held responsible. Once we have shipped and fulfilled an order, we are no longer responsible for the package as it is handled through the mail service and no longer in our control. Please see Refund Policy below. Please note that vintage and previously used items will exhibit a certain amount of natural wear and/or weathering. All flaws observed will be disclosed in photos and/or description. Please contact us if you feel an item has been grossly misrepresented and we can work towards a satisfactory resolution. We try our best to provide quality pictures that accurately show the condition of each item; however, colors and brightness within photos may vary slightly between computer monitors. Any flaws observed will be mentioned in the description. We advise all buyers to use the "zoom in" feature in order to see accurate depiction of items. Please contact us if you have any questions or concerns regarding an item. We are more than happy to provide additional information and can also provide more photos upon request. © 2019 The White Elephant Co.